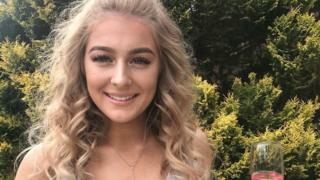 Image caption Betty Wood's family said she was "incredibly kind, hysterically funny and exceptionally beautiful"
An 18-year-old woman has died in a crash in Derby. Betty Wood, from Belper, in Derbyshire, was a passenger in one of two cars that were involved in a collision at 01:10 BST on Sunday. Both drivers were arrested at the scene and, after being treated at hospital, were interviewed and released under investigation while inquiries continue. Miss Wood's family said she was "incredibly kind, hysterically funny and exceptionally beautiful". In a statement released by police, Miss Wood's family said: "Betty was a truly amazing daughter, sister and friend. "She was unique. To us she was just 'Little Betty'. "Our lives will never be the same, our hearts are broken and our world will miss the beauty and light she brought to us all." Miss Wood was in a blue Renault Clio when it was involved in a collision with a silver Mercedes E320. She was airlifted to hospital after the crash at the junction of Friar Gate and Stafford Street but she did not survive the injuries she sustained.